Rarely available. 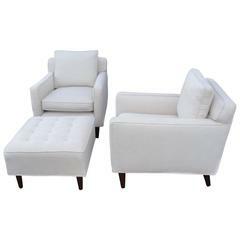 Two matching Arne Wahl Iversen chair/ottoman sets (priced individually for each two-piece set as shown in primary photo). 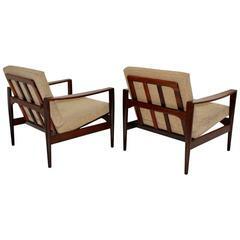 Solid teak frames with restored finish and newly upholstered cushions. Ottomans retain original Fagas straps. Armchairs have replaced webbing. Produced by Komfort, Denmark, circa 1960. 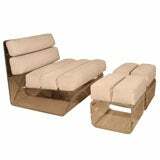 Note: Dimensions below are for armchair only. 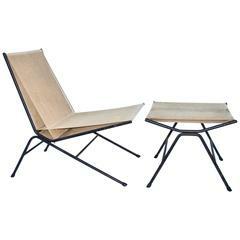 Ottoman is 18 H x 28 W x 17 D.
Midcentury Danish lounge chair by Arne Wahl Iversen, 1960s. Original cushion in green leather in very good condition.